Not to be confused with Interstellar comet. An exocomet, or extrasolar comet, is a comet outside the Solar System, which includes interstellar comets and those that orbit stars other than the Sun. The first exocomets were detected in 1987 around Beta Pictoris, a very young A-type main-sequence star. There are now a total of 11 stars around which exocomets have been observed or suspected. All discovered exocometary systems (Beta Pictoris, HR 10, 51 Ophiuchi, HR 2174, 49 Ceti, 5 Vulpeculae, 2 Andromedae, HD 21620, HD 42111, HD 110411, and more recently HD 172555) are around very young A-type stars. The exocomets can be detected by spectroscopy as they transit their host stars. The transits of exocomets, like the transits of exoplanets, produce variations in the light received from the star. Changes are observed in the absorption lines of the stellar spectrum: the occultation of the star by the gas cloud coming from the exocomet produces additional absorption features beyond those normally seen in that star, like those observed in the ionized calcium lines. As the comet comes close enough to the star, cometary gas is evolved from the evaporation of volatile ices and dust with it. Observations of comets, and especially exocomets, improve our understanding of planet formation. Indeed, in the standard model of planet formation by accretion, planets are the result of the agglomeration of planetesimals, themselves formed by the coalescence of dust from the protoplanetary disk surrounding the star shortly after its formation. Thus, comets are the residuals of the volatile-rich planetesimals that remained in the planetary system without having been incorporated into the planets. They are considered fossil bodies that have seen the physical and chemical conditions prevailing at the time of planet formation. A gaseous cloud around 49 Ceti has been attributed to the collisions of comets in that planetary system. Artist's impression of exocomets plunging into young star HD 172555. 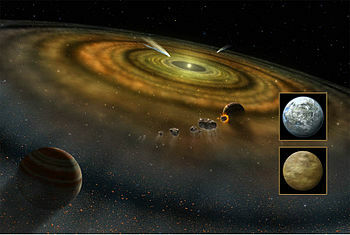 Video – artist's impression of exocomets orbiting the star Beta Pictoris. ^ Ferlet, R.; Vidal-Madjar, A. & Hobbs, L. M. (1987). "The Beta Pictoris circumstellar disk. V - Time variations of the CA II-K line". Astronomy and Astrophysics. 185: 267–270. Bibcode:1987A&A...185..267F. ^ a b Lagrange-Henri, A. M.; Beust, H.; Ferlet, R.; Vidal-Madjar, A. & Hobbs, L. M. (1990). "HR 10 - A new Beta Pictoris-like star?". Astronomy and Astrophysics. 227: L13–L16. Bibcode:1990A&A...227L..13L. ^ a b Welsh, B. Y.; Montgomery, S. (2013). "Circumstellar Gas-Disk Variability Around A-Type Stars: The Detection of Exocomets?". Publications of the Astronomical Society of the Pacific. 125 (929): 759–774. Bibcode:2013PASP..125..759W. doi:10.1086/671757. ^ a b Kiefer, F.; Lecavelier Des Etangs, A.; et al. (2014). "Exocomets in the circumstellar gas disk of HD 172555". Astronomy and Astrophysics. 561: L10. arXiv:1401.1365. Bibcode:2014A&A...561L..10K. doi:10.1051/0004-6361/201323128. ^ "'Exocomets' Common Across Milky Way Galaxy". Space.com. 7 January 2013. Archived from the original on 16 September 2014. Retrieved 8 January 2013. ^ Zuckerman, B.; Song, Inseok (2012). "A 40 Myr Old Gaseous Circumstellar Disk at 49 Ceti: Massive CO-Rich Comet Clouds at Young A-Type Stars". The Astrophysical Journal. 758 (2): 77. arXiv:1207.1747. doi:10.1088/0004-637X/758/2/77. ^ "Exocomets plunging into a young star (artist's impression)". www.spacetelescope.org. Retrieved 12 January 2017. Look up Exocomet in Wiktionary, the free dictionary.